Every year, on the 4th of July, Americans celebrate the anniversary of the country’s founding. One of the many aspects of the country worth celebrating is its music. 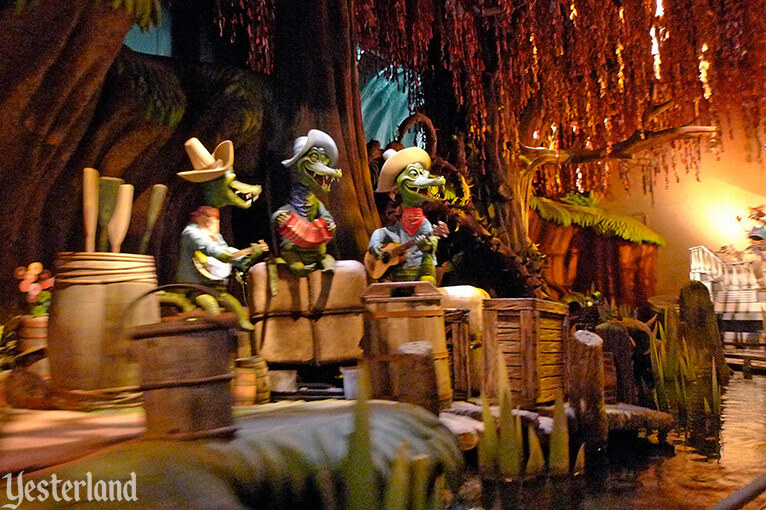 At Yesterland, America Sings is a nostalgic and patriotic salute to American music. The Carousel Theater, home of America Sings, is a two-level building. But America Sings only uses the lower floor. PeopleMover trains pass through the SuperSpeed Tunnel on the upper floor. Enter one of six identical theaters and have a seat. Prepare to meet Sam the Eagle. When you hear the name Sam the Eagle, the first line to pop into your head might be, “a salute to all nations, but mostly America.” But that’s a different Sam the Eagle, and that line is from MuppetVision 3-D.
Sam the Eagle in America Sings, voiced by Burl Ives, is an entirely different character, despite sharing the name with the Muppet. Sam the Eagle and his sidekick, an owl named Ollie, provide a prologue when the theater doors close. They continue to be your hosts as your theater rotates around a central core in six steps. To the tune of “Yankee Doodle,” Sam introduces four big musical acts while your theater is moving. When the movement stops, the acts begin. Sitting next to a bubbling still, a coyote sings “The Birmingham Jail,” as a jail cell rises behind him. 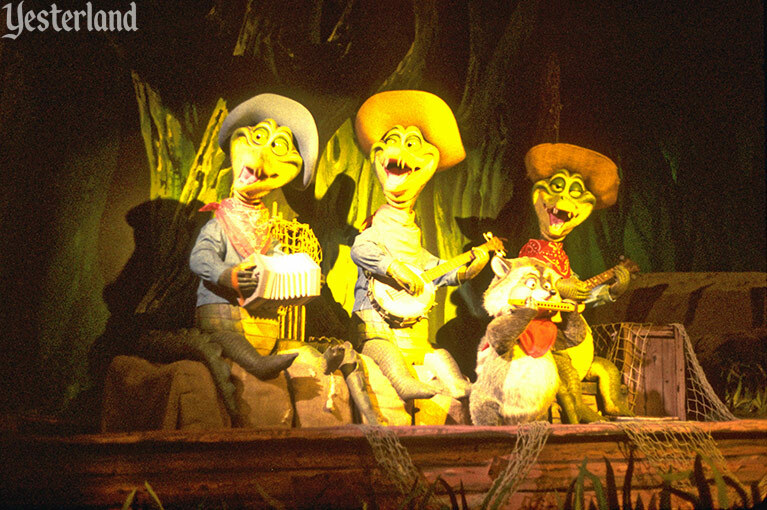 A guitar-playing dog finishes the set by crooning “Home on the Range,” as little critters appear around him. He had me figured nine dollars in the hole. An inebriated goose named Blossom-Nose Murphy sings “Sweet Adeline,” with the quartet of geese joining in. For the grand finale, most of the scene’s cast performs “Joy to the World” (the Three Dog Night song, not the Christmas carol). 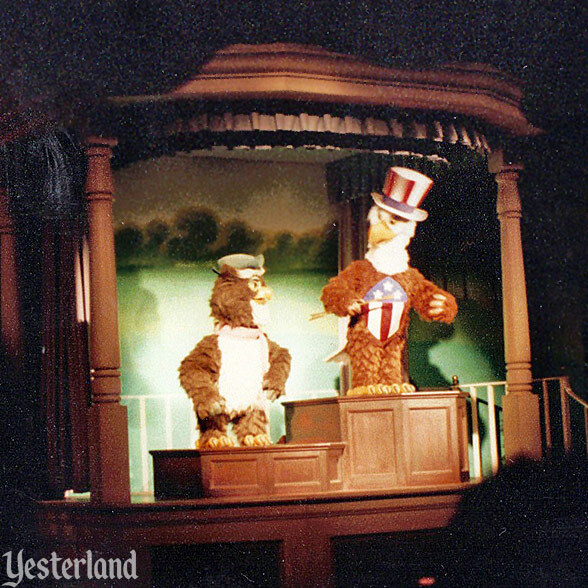 America Sings opened in Disneyland in June 1974. It replaced the General Electric Carousel of Progress in Tomorrowland’s Carousel Theater, after the Carousel of Progress moved to Tomorrowland at Walt Disney World’s Magic Kingdom. 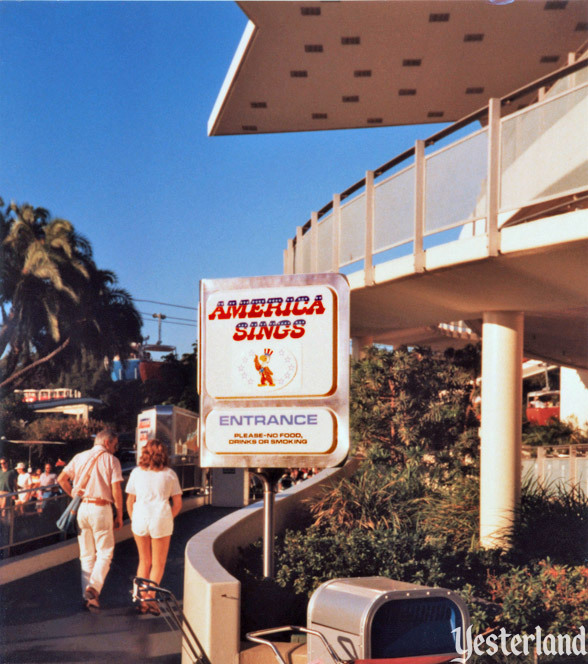 America Sings was a fast-moving, entertaining show for all ages—a worthy 1970s-American-Bicentennial-era successor to the Carousel of Progress, which had so amazed audiences in the 1960s. 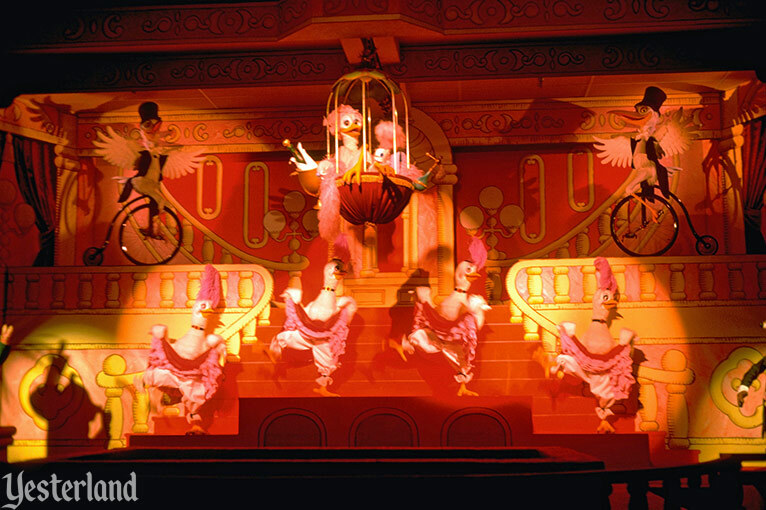 America Sings used clever theatrical techniques to make the performers appear on the stage, such as having characters rise up into view on one side of the stage while lighting directed the audience’s attention to the other side of the stage. 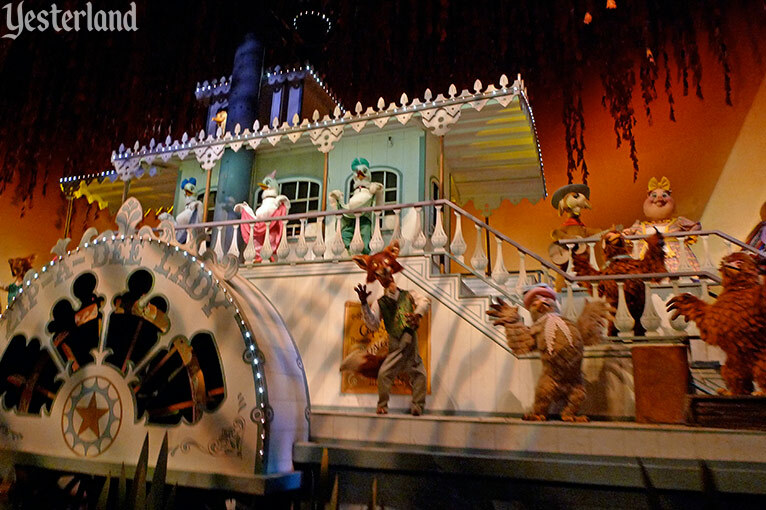 The Enchanted Tiki Room and the Country Bear Jamboree had introduced the concept of the Audio-Animatronic musical revue, but America Sings took the concept to a new level. 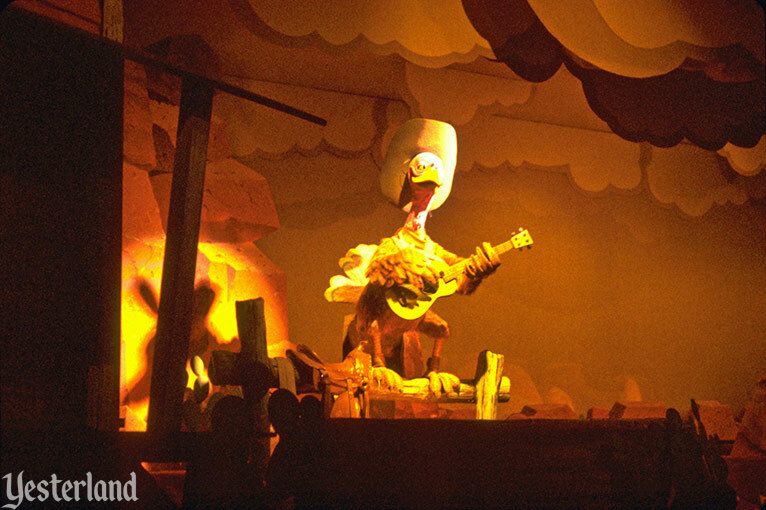 The Carousel Theater was a brilliant way to present a show. It provided a huge hourly capacity, yet with intimate theaters that allowed everyone to be close to the stage. Instead of the long waits between the shows of a conventional batch-loading theater, a new show could begin in the Carousel Theater every few minutes. After a run of almost 14 years—twice as long as the Carousel Theater’s previous show—America Sings closed permanently in April 1988. Brand new attraction is coming! 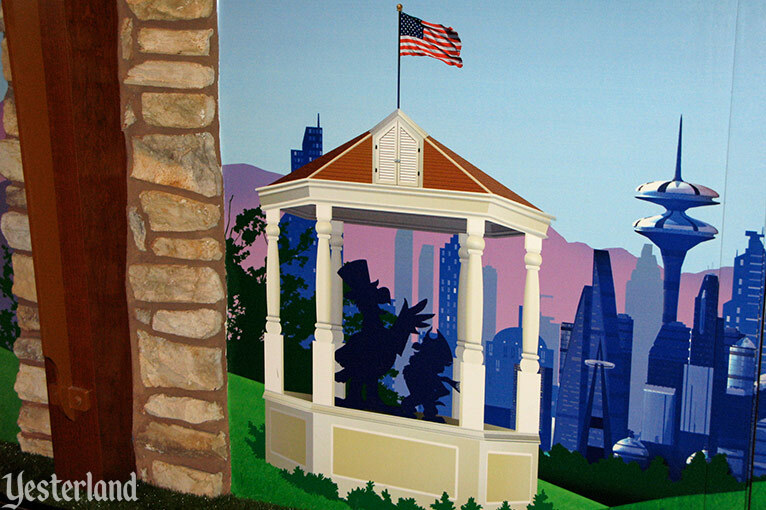 After America Sings closed, a sign on the Carousel Theater promised that a new attraction was in the works. 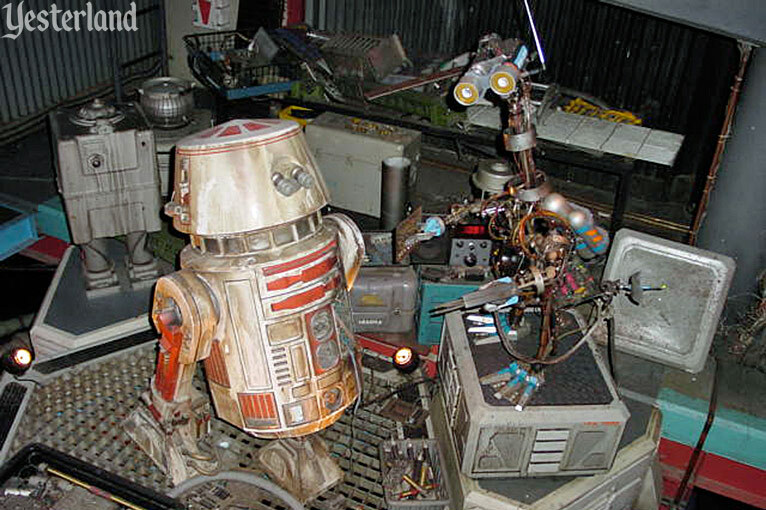 Whatever creative ideas the Imagineers in Glendale had for the space, those ideas never made it to Anaheim. For many years, the Carousel Theater was used as office space. The imposing, round building occupied a prime location in Tomorrowland, making it painfully obvious to guests that this was a shuttered attraction. To make matters worse, the adjacent Mission to Mars closed in November 1992 and Skyway to Fantasyland closed in November 1994. 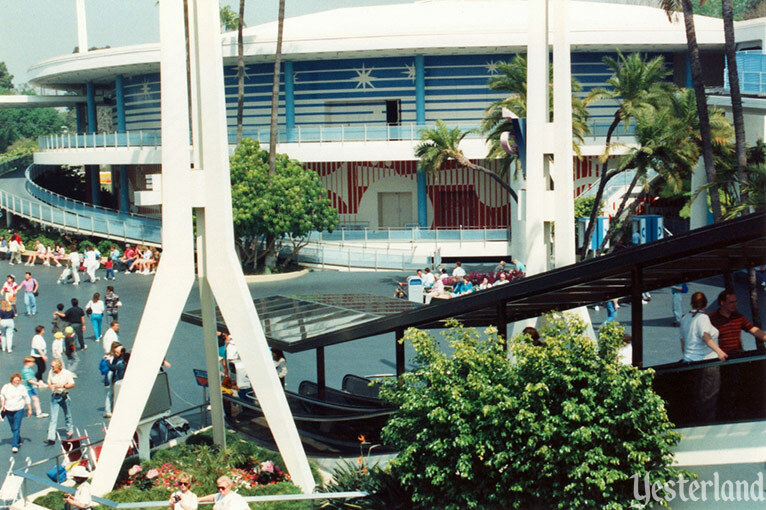 This corner of Tomorrowland had become the Disneyland equivalent of a boarded-up downtown block. 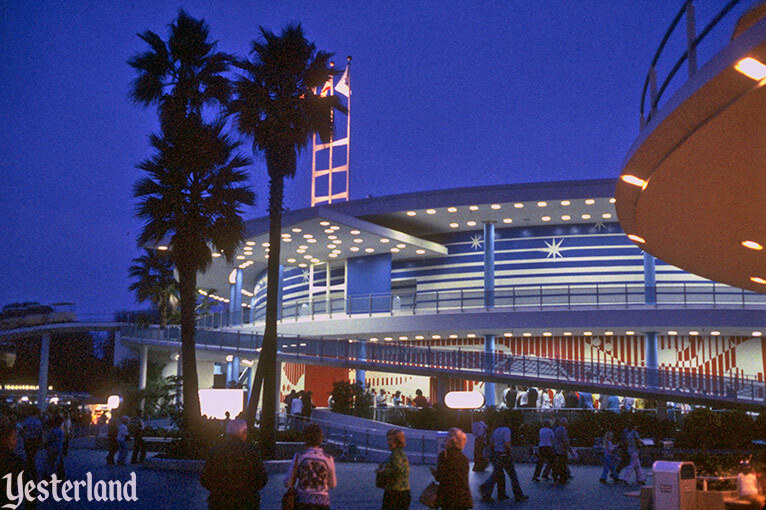 Finally, in 1996, construction began to convert the Carousel Theater into a new attraction. 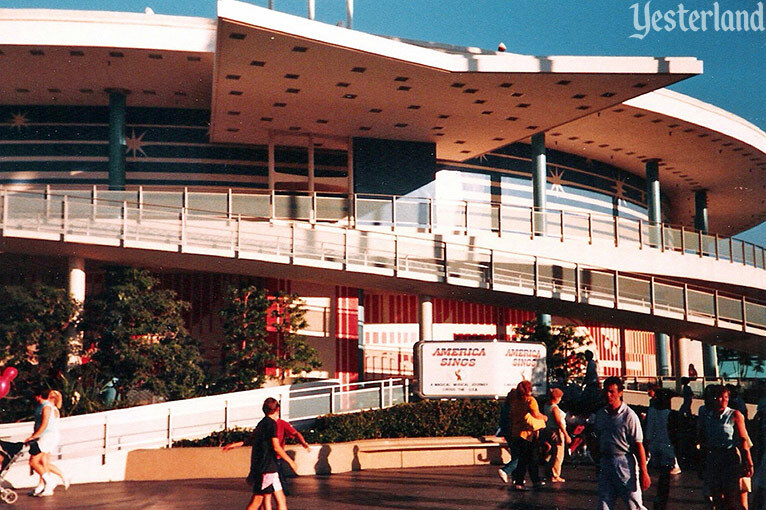 Innoventions, a collection of technology exhibits, opened in 1998. Unfortunately, the Carousel Theater had been gutted. 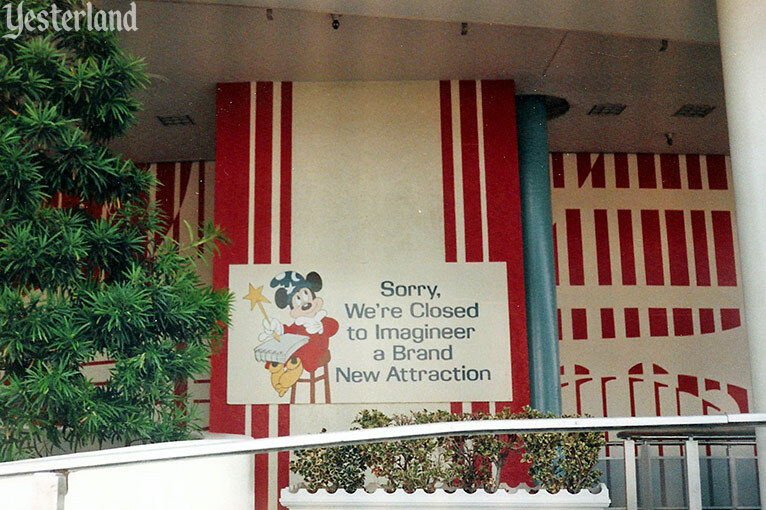 When Innoventions opened, guests still had to wait for doors that only opened for a short time every few minutes. But they were no longer entering a theater section. Instead, guests entered a two-level exhibit building with a lower floor that rotated for no particular reason (except to vary which exhibit a guest initially entered). 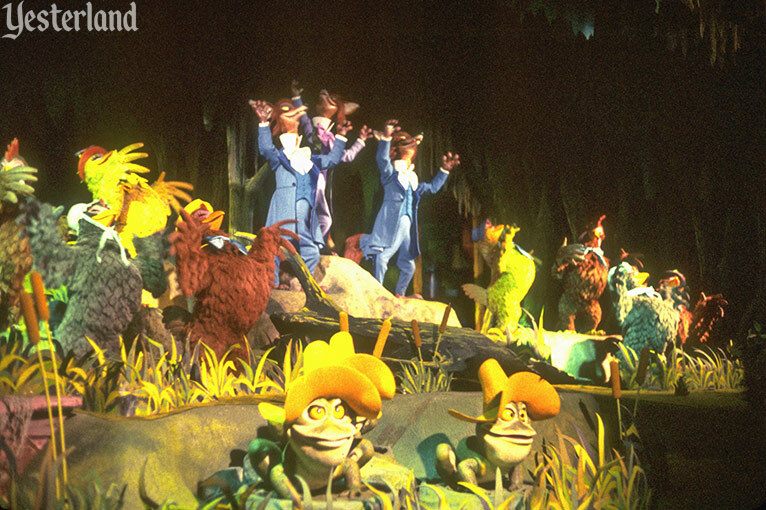 Do the frogs, chickens, and foxes from America Sings look strangely familiar? They should, if you’ve ridden Disneyland’s Splash Mountain. 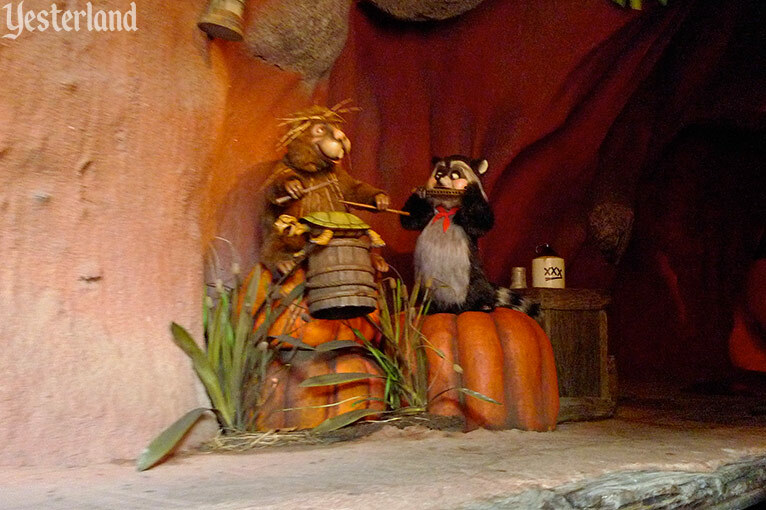 In 1989, almost all the critters from America Sings took up residence at Splash Mountain. They fit right in with the characters from Walt Disney’s 1946 classic, Song of the South—as if they had been part of the movie. The common denominator was Disney Legend Marc Davis, who designed the characters for Song of the South and America Sings. A couple of geese from America Sings stayed in Tomorrowland. 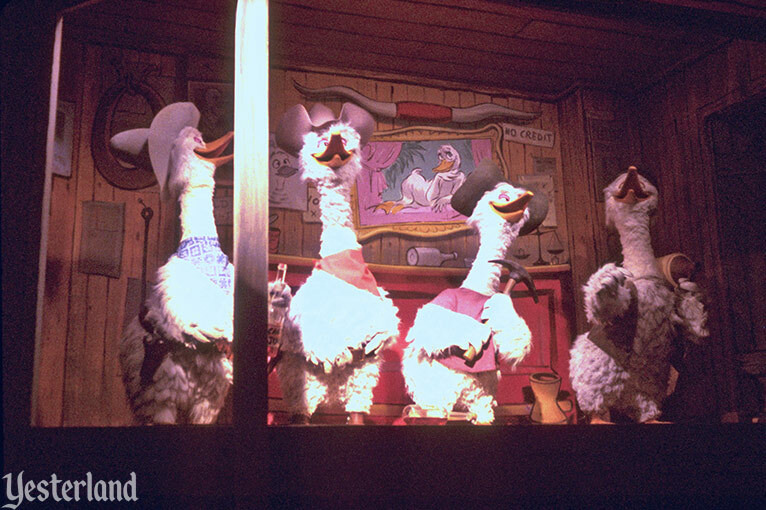 These geese didn’t even wait for America Sings to close before becoming long-necked robots in queue for Star Tours (1987). In the first two acts, the Geese Quartet became the Geese Trio.